How Do I Become a Rehabilitation Assistant? 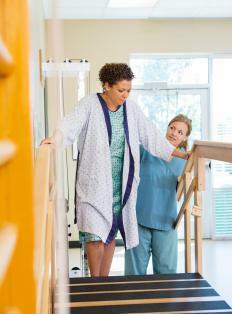 A rehabilitation assistant may assist with physical therapy. There are several necessary steps to become a rehabilitation assistance, including acquiring the correct education, becoming certified in the field, and continuing education after employment. Standard rehabilitation assistant duties include cleaning and maintaining the physical therapy equipment, assisting patients with their exercises, and closely following the instructions laid out by the physical or occupational therapist. This type of career requires the candidate to have physical strength and endurance as well as to understand the mechanics of conventional physical therapy procedures. It is estimated that opportunities in the rehabilitation assistant careers will continue to rise and provide lucrative jobs for many qualified professionals. In order to become a rehabilitation assistant, candidates must have a minimum of a high school diploma, though many jurisdictions are now requiring an associate's degree in the field. Students can find the appropriate course studies in most community or technical college programs and can expect to spend roughly two years preparing for their qualifying exam. Rehab assistant students can expect to study topics such as pathologies of the body, anatomy and physiology, movement science, patient care basics, and occupational therapy techniques. Financial aid is often available for qualified students, including grants, loans, and scholarships. Once you have obtained an associate's degree in rehabilitation assisting, the next step to become a rehabilitation assistant in many countries is to take a national exam and become certified in the field. In some areas, passing this exam is enough to become licensed to work, but there are some that also require the candidate to pass a regional certification exam as well. Students can expect these exams to ask in depth questions pertaining to the material covered during their two years in the rehabilitation studies program. During the exam, candidates are usually given several hours to complete the test. Special considerations may be made for students with disabilities to assist them in successfully completing the work to become a rehabilitation assistant. 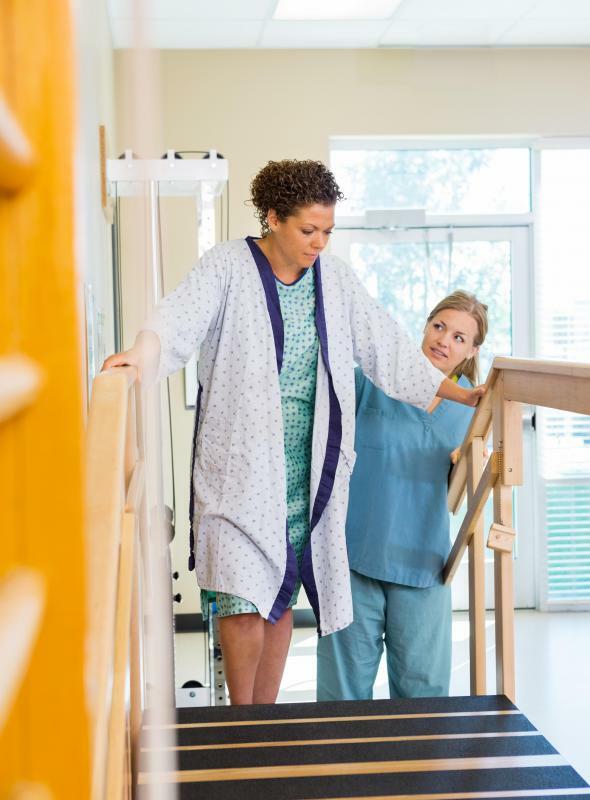 After receiving your education and certification to become a rehabilitation assistant, it is common practice for physical therapy clinics, hospitals, and other medical offices to require continued education for their assistants and other professionals. In some cases, this extended education is to help the rehabilitation assistants focus their skills on one area of physical therapy. These classes are usually provided by the place of employment and feature the latest updates in the field, such as new therapy techniques and training on the latest equipment options. What Does a Rehabilitation Assistant Do? What is Occupational Therapy Rehabilitation? How do I Become a Rehabilitation Therapist? What are the Different Physiotherapy Assistant Jobs? What is Physical Therapy Rehabilitation?